BufferedWriter class writes text to a character-output stream, buffering characters so as to provide for the efficient writing of single characters, arrays, and strings. In general, a Writer sends its output immediately to the underlying character or byte stream. Unless prompt output is required, it is advisable to wrap a BufferedWriter around any Writer whose write() operations may be costly, such as FileWriters and OutputStreamWriters. BufferedWriter(Writer out) - Creates a buffered character-output stream that uses a default-sized output buffer. BufferedWriter(Writer out, int sz) - Creates a new buffered character-output stream that uses an output buffer of the given size. void close() - Closes the stream, flushing it first. void flush() - Flushes the stream. void newLine() - Writes a line separator. void write(char cbuf, int off, int len) - Writes a portion of an array of characters. 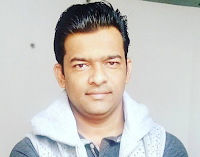 void write(int c) - Writes a single character. void write(String s, int off, int len) - Writes a portion of a String. 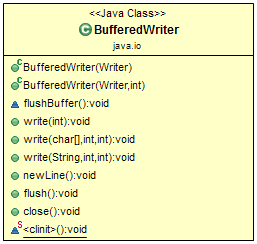 * The class demonstrate the usage of BufferedWriter class methods.